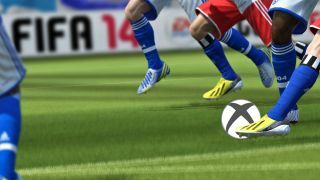 Whether you are a FIFA fanatic or not, Microsoft's big Gamescom reveal that it will bundle the EA Sports football game with Xbox One pre-orders is sending out a huge message: let's park the talk of motion control, TV trickery and monolithic designs, and start talking about the games. FIFA, just like the Call of Duty and GTA, is among a small list of franchises that are almost certain to top charts on their release and, therefore, are at the forefront of gamers' minds. For EA Sports you'd imagine that the bundle is a no-brainer - bringing a potentially huge new audience to its footy franchise and revenue from Microsoft. And it doesn't even have to forego the PS4 audience who will no doubt still be snapping it up with or without the Xbox only Ultimate Team Legends. For me, the real impact of the announcement probably isn't that it will convert a legion of PS4 Fifa fans to the Xbox, but more that Microsoft has got back on the message it, frankly, should have been hammering from the off. After the media hub mess of the opening Xbox One reveal, E3 had tried to bring the focus firmly back to the core audience, but it is this latest salvo in the console wars that really underlines that Microsoft is back, ahem, in the game. I'm sure a lot of people will be railing against the choice of FIFA 14, and many more will be delighted, but the bigger picture here is the intent of Microsoft to put its money where its mouth is. With big ticket partnerships like EA and Activision, with a chunk of Call of Duty: Ghosts exclusive content announced, and first-party content that includes Halo, Forza, Dead Rising, Killer Instinct, Fable and Ryze, Microsoft is essentially making it clear that it is not ready to put gaming in the shadows to push its home entertainment mission into the box seat. That's not to say that Sony will feel too uncomfortable; it's been playing the game card since the off, making sure that games like Killzone are pushed, and keeping franchises like Uncharted and Gran Turismo just off stage. We're hugely excited about the next generation, and for all the app bells and TV whistles, it is the gaming part of the next-gen that is most catching our attention. Because when we fire up our console for the first time it will be to play games. And neither Sony nor Microsoft should lose sight of that.